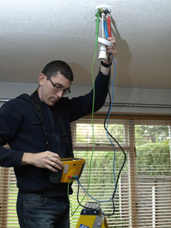 "I'm really pleased to have found a local electrician who is reliable and who I can trust to do a really good job. Dave was friendly, professional and the work was carried out to an excellent standard. Highly recommended." An RCD is a safety device that switches off electricity automatically if there is a fault. RCDs are far more sensitive than normal fuses and circuit-breakers and provide additional protection against electric shock. Additional protection by means of an RCD can be a lifesaver. An RCD constantly monitors the electric current flowing along a circuit. If it detects electricity flowing down an unintended path, such as through a person who has touched a live part, it will switch the circuit off very quickly, thereby significantly reducing the risk of death or serious injury. Using electricity whilst wet significantly increases the risk of electric shock. If you are wet and in contact with the ground, it makes it easier for the electricity to flow through you. 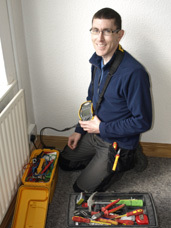 RCDs can help protect you from electric shock in areas, such as in bathrooms and gardens, where you may be wet. It is very important to have RCD protection when using electrical equipment outdoors. Without it, a simple job like mowing the lawn could turn into a deadly disaster if you cut through the electrical lead. In July 2008 a new edition of the UK standard for the safety of electrical installations, BS 7671: 2008, came into effect. This standard now calls for virtually all circuits in new or rewired homes to be provided with additional protection by means of an RCD. Fixed RCDs – are installed in the consumer unit (fusebox) and can provide protection to individual or groups of circuits. A fixed RCD provides the highest level of protection as it constantly protects all sockets on a circuit and any connected appliances. 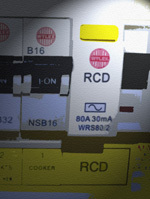 Socket-outlet RCDs – are built into a special socket-outlet that replaces a standard socket-outlet. This type of RCD provides protection only to the person in contact with the equipment, including the leads, plugged into the special socket-outlet. Portable RCDs – plug into any standard socket-outlet. An appliance can then be plugged into the RCD. These are useful when neither fixed nor socket-outlet RCDs are available, but again they provide protection only to the person in contact with the equipment, including the leads, plugged into the portable RCD. Research by the Electricity Safety Council found that fixed RCDs are about 97% reliable and that this rate improved if they were regularly tested by users. If you have fixed RCD protection, you can rely on it to not only reduce the risk of electric shock to you and your family, but also to reduce the risk of damage being caused to your property by fire caused by faulty wiring or appliances. Although RCD protection reduces the risk of death or injury from electric shock, it does not reduce the need to protect yourself, family and property by having your electrical wiring checked at least every 10 years. If you think there is a fault with your wiring or an appliance, stop using it immediately and contact a registered electrician. A good tip is to always test your fixed RCDs when changing to and from daylight saving, as many electric clocks and timers have to be reset anyway. It is strongly recommended that you test all fixed and socket-outlet RCDs regularly (about every three months) by using the ‘test’ button built into them. Manufacturers recommend that portable RCDs are tested every time you use them. Do not hold the test button in for a long time if the RCD does not trip. If the RCD does not switch off the supply when you use the test button, get advice from a registered electrician.